Dan Caton (Caton rhymes with "Dayton"), grew up in Tampa, Florida and attended the University of South Florida, graduating in 1973 with B.A. 's in astronomy and physics. He stayed on to get a Masters in astronomy, and married Susan Hatcher in 1976. They moved to Gainesville where he got his Ph.D. in astronomy. After graduation he took a temporary position at Appalachian State University in Boone, North Carolina, for two years. When that position ended he left for a year at Salisbury State College in Maryland. When a tenure-track position came open back at Appalachian, he and Susan returned to Boone, where he eventually became a tenured full professor of physics and astronomy, and Director of Observatories. 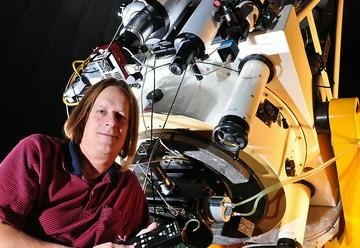 His area of expertise is in the study of binary stars--pairs of stars that orbit each other. Such systems include most of the stars in our galaxy--the single stars like our Sun are the exceptions. Other work includes CCD drift-scan observations of stars occulted by asteroids, CCD photometry of the transits of exoplanets around their parent stars, and studies of flare rates in flare stars in binary star systems. As the founding president of the North Carolina Section of the International Dark-Sky Association, Caton works to reduce light pollution in the state. Caton also works to debunk pseudoscience and at the same time investigates claims of the paranormal in such phenomena as the Brown Mountain Lights, having appeared on specials on Discovery Kids, the Travel Channel, and the National Geographic Channel. He is part of a group of researchers on the lights, and operates two cameras nightly imaging the mountain and the Linville Gorge. Caton has been a contributor of columns to the Charlotte Observer since 1996 and currently writes the monthly Up in the Air column for the Observer's SciTech section, appearing the third Monday of the month in the Observer and in the Raleigh News & Observer. Susan and Dan have twins, son Ashton and daughter Celeste, who graduated recently from Appalachian State.